Saratoga Springs is located near the southern boundary of Death Valley National Park. Several springs feed three large open water ponds approximately 6.6 acres in size. 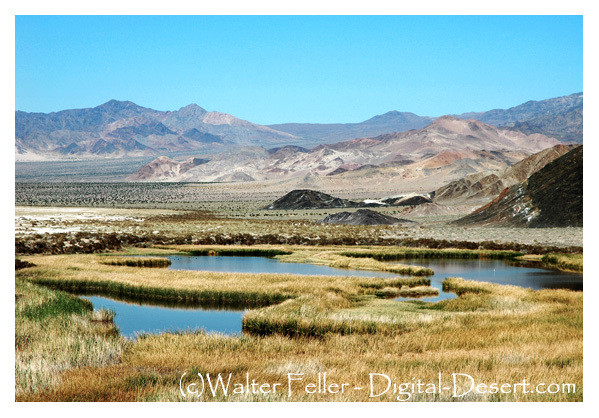 This desert wetland supports a rich community of plants and animals. Common reeds, bulrush, and saltgrass provide food and shelter for many of the animals living here. (Cyprinodon nevadensis nevadensis) an endemic Death Valley species. Like Ibex Springs to the north, activities at Saratoga Springs have been constant and varied over the last hundred years, for the springs have long been the most important watering spot in the south Death Valley region. As with Ibex Springs, little remains to bear witness to Saratogas past, due to the destruction wrought by years of harsh weather and the sticky hands of generations of prospectors and travelers.